In 6 Rainbow Jewel Birthstone Colors! 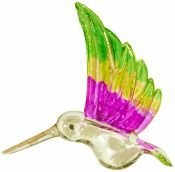 Charming spun glass Green, Yellow and Violet Rainbow hued Hummingbird Suncatcher. The wings and tail are tinged with rainbow colors. Use as a window or auto hanging ornament or hang on a prism holder. Hand made glass hummingbird ornament with crystal eyes and nylon string hanger. 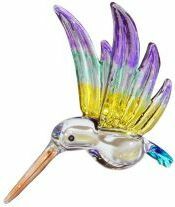 Attractive spun glass Purple, Aqua and Yellow Rainbow hued Hummingbird Suncatcher. The wings and tail are tinged with rainbow colors. Use as a window or auto hanging ornament or hang on a prism holder. 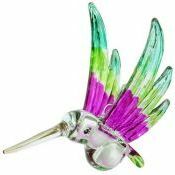 Hand made glass hummingbird ornament with crystal eyes and nylon string hanger. 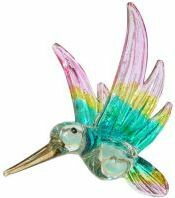 Charming spun glass Pink, Yellow and Aqua Rainbow hued Hummingbird Suncatcher. The wings and tail are tinged with rainbow colors. Use as a window or auto hanging ornament or hang on a prism holder. Hand made glass hummingbird ornament with crystal eyes and nylon string hanger. 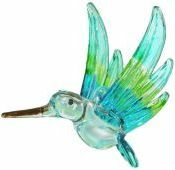 Eye popping spun glass Aqua, Lime Green and Violet Rainbow hued Hummingbird Suncatcher. The wings and tail are tinged with rainbow colors. Use as a window or auto hanging ornament or hang on a prism holder. Hand made glass hummingbird ornament with crystal eyes and nylon string hanger. 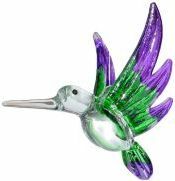 Dramatic spun glass Purple and Emerald Green hued Hummingbird Suncatcher. The wings and tail are tinged with rainbow colors. Use as a window or auto hanging ornament or hang on a prism holder. Hand made glass hummingbird ornament with crystal eyes and nylon string hanger. 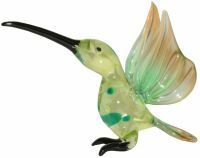 Charming spun glass Aqua, Lime Green and Blue hued Hummingbird Suncatcher. The wings and tail are tinged with rainbow colors. Use as a window or auto hanging ornament or hang on a prism holder. Hand made glass hummingbird ornament with crystal eyes and nylon string hanger.